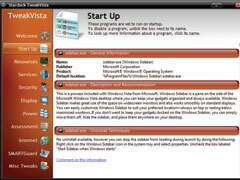 Microsoft has increased both the power and complexity of its popular Windows operating system with the release of Windows Vista. 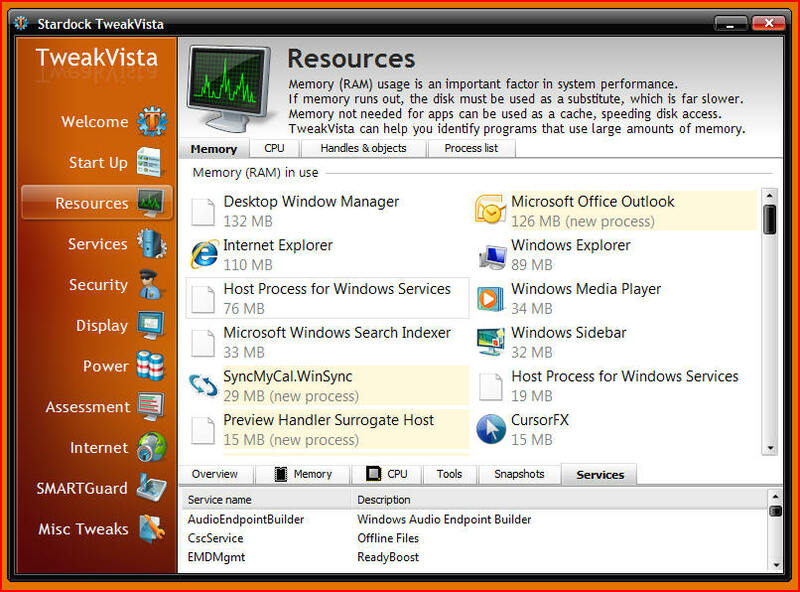 Stardock’s TweakVista™ enhancement application helps you configure Windows Vista to meet your personal needs by improving performance. Unlike other power tools for Windows, TweakVista automatically prompts enhancement recommendations, offering easy “one click” updates to otherwise complex configuration changes. TweakVista is also safe to use. By utilizing Microsoft’s system-restore technology any changes you make can easily be rolled back. You can freely experiment with different settings without disabling your computer. "Check out the 5 star review on Download.com"
A revolutionary product for Windows Vista! Performance Assessments. 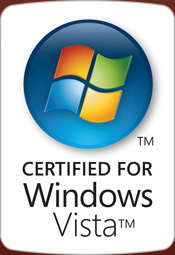 TweakVista uses the new Windows Vista assessment features to benchmark nearly every aspect of a user’s PC and allow them to submit their results for comparison with other users of similar or upgraded hardware. Reports indicate where the user's PC ranks amongst other submissions. Snapshots (new in v1.1). Not to be confused with Microsoft's System Restore Points (also unofficially called snapshots) this new feature of TweakVista allows users to determine "what changed" from a software perspective on their PC. This new feature will help users pinpoint applications that are running since the last snapshot. Typically, users install favorite applications on their computers right after purchase. Applications that load as hidden components of installations or software the user is just test driving are often the source of issues. The snapshot feature helps with these "unknown" applications to pinpoint misbehaving applications; all applications installed later will be highlighted for the user in the TweakVista interface. The key difference between a system restore point and TweakVista armed with snapshots is that users can "undo" changes in a more granular way. With system restore points moving between each restore point is an all-or-nothing proposition. 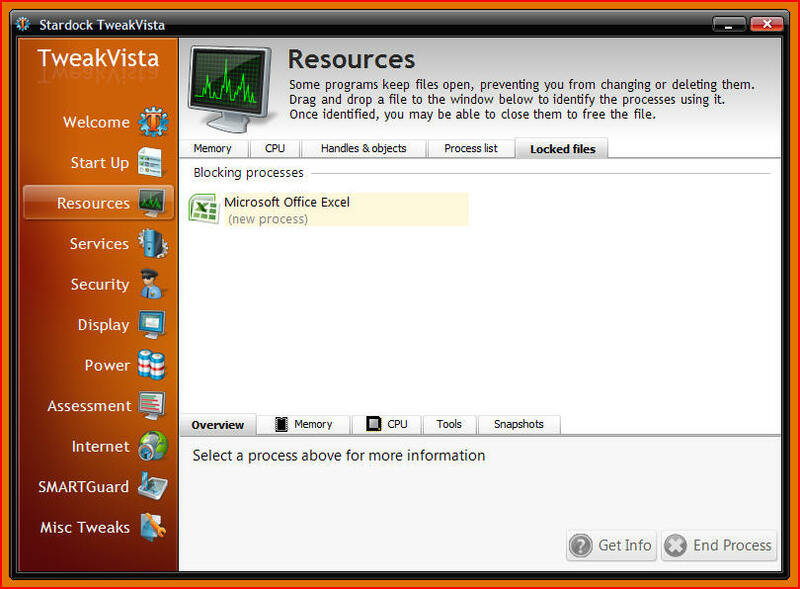 With TweakVista users can control the configuration of their computer on a much more granular level undoing and redoing settings quickly and easily. Services View (new in v1.1). This new feature allows users to view services and start/stop/disable directly from within TweakVista. Services also are now also support by the Get Info button to learn more about a particular service before making changes to your system. Host Process for Windows View (new in v1.1). TweakVista will now display what services are running inside of the mysterious "Host Processes for Windows" processes that show up in Task Manager. This will help users determine what services are taking up memory, what those services are and combined with the new Services Tab allow them to disable unnecessary services on the computer. Locked File Information (new in v1.1). TweakVista can now tell you what process has a file locked. A locked file is a computer file that cannot be altered. Normal users of such files cannot alter the information they contain, change their location, or alter their names. Often this is caused by a program opening a file as an exclusive read. This means that the file cannot be deleted or edited. TweakVista can tell you what program has the file locked. By stopping the process that has the file locked, users can regain access to these locked files. Performance / Memory Analysis – TweakVista provides the user with information about what processes are consuming your system’s valuable resources and allows you to change the configuration of Windows to only run the processes you need. 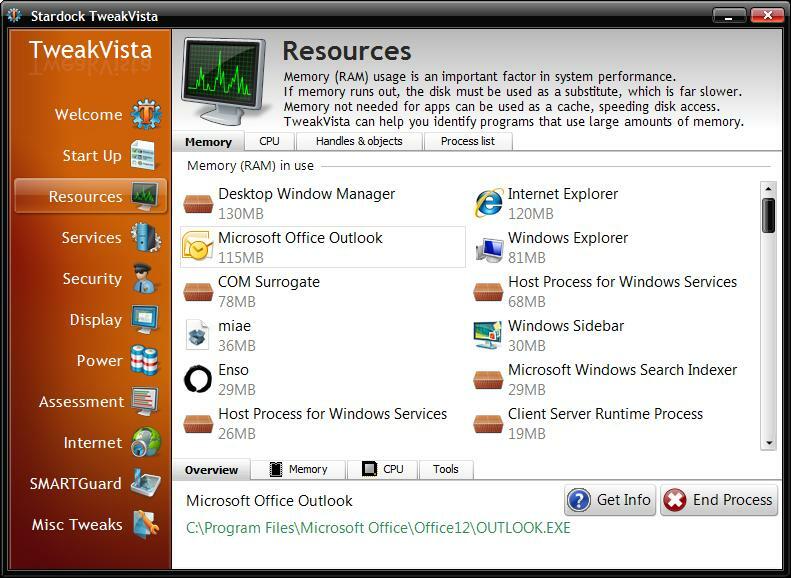 Security (User Access Control) Management – TweakVista has easy to configure security settings for managing the new security features of Windows Vista. Other security settings can also be configured with one-click. 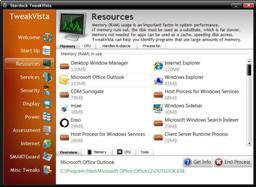 If you've found some of the security prompts in Windows Vista getting in your way, TweakVista offers relief. 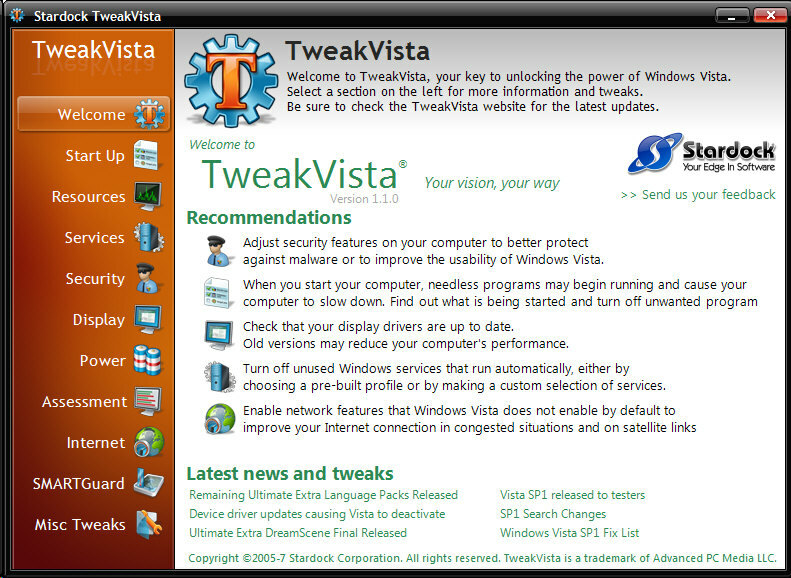 TweakVista.com Integration - Access to the latest tweaks, tips, and help from TweakVista.com, authors of the new book Hacking Windows Vista . Start-Up Manager - See what programs are being launched on start-up (even ones that you may not be aware of) and quickly find out what they are doing and whether you need them. 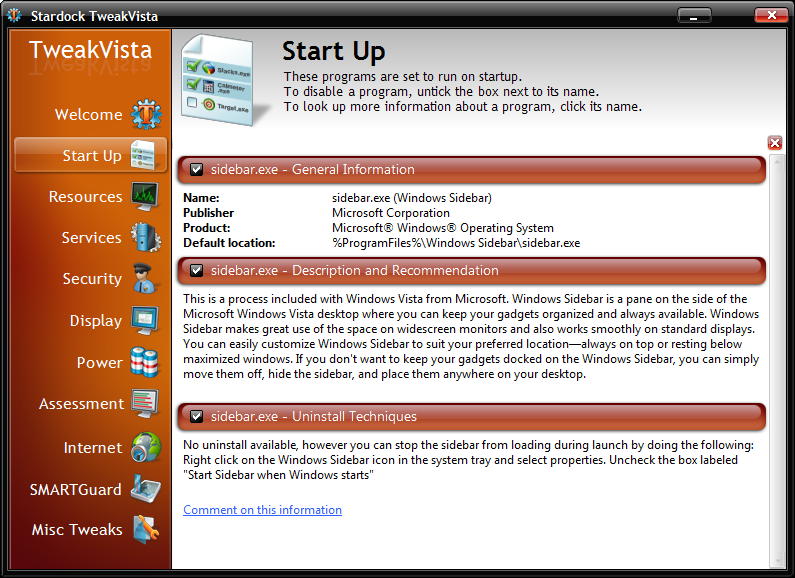 By utilizing the startup monitor built into Windows Vista to analyze problems; processes that take longer to start or shutdown are flagged for review. 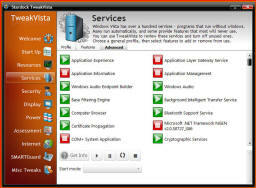 Recommendations – Automatically evaluate all aspects of your Windows Vista configuration with detailed, yet easy to understand, suggestions provided to help you get more control over your Windows Vista PC. Process Identification – Leveraging the community, users can read and create information regarding each process currently running. When a user clicks on a program name TweakVista returns information about that process to help in deciding what to leave running and what to shut off. 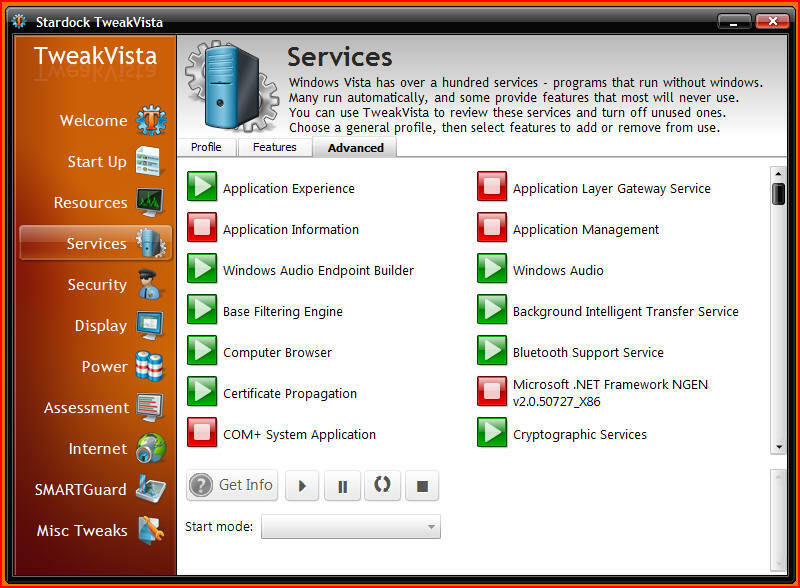 Performance Optimization - TweakVista knows all the default services on Windows Vista and many of them are not needed for most people. TweakVista can safely guide users through common user configurations to optimize performance and memory use. Internet Optimization - TweakVista can improve your Internet surfing performance by changing the underlying Internet settings on Windows Vista to fit the capabilities of your PC. 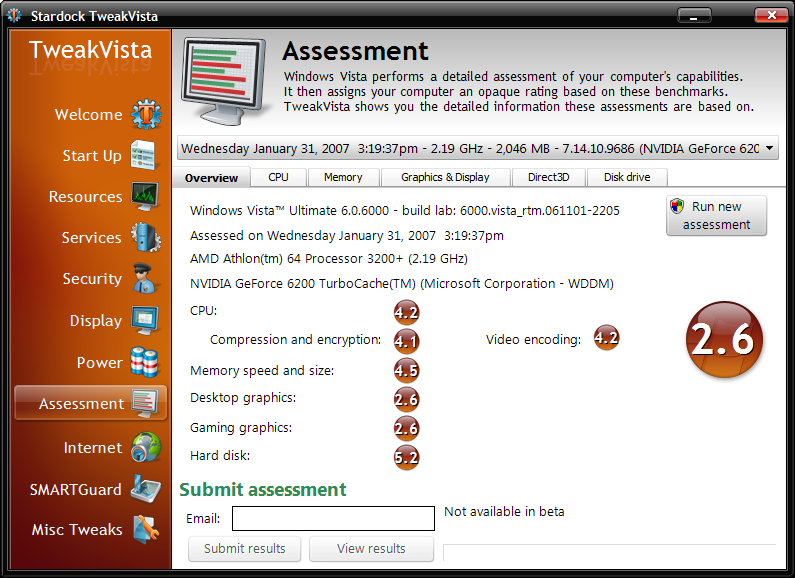 Assessment Comparison – TweakVista allows the user to use Windows Vista's built in Assessment information to compare their computer against other TweakVista users. Data can be anonoymously uploaded and compared against averages and top scores. 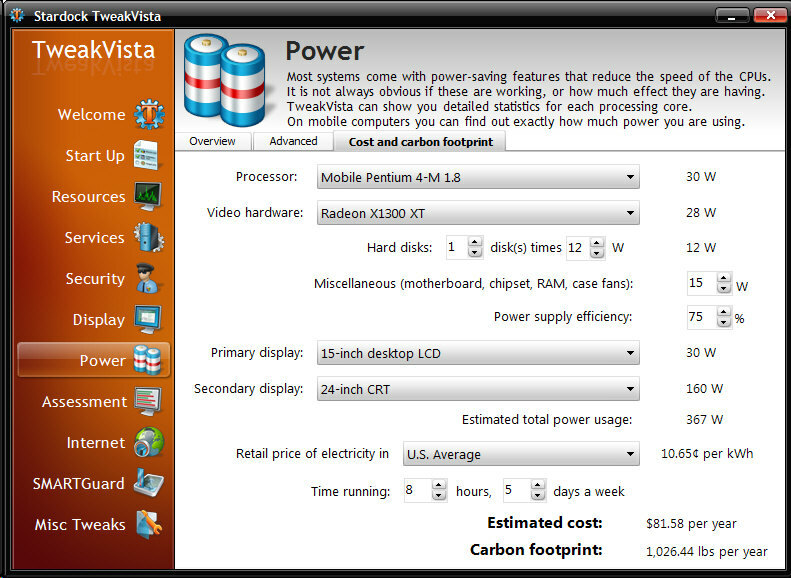 Cost of Use and Carbon Footprint Analysis – TweakVista calculates the cost of running your PC. In addition a Carbon Footprint index is calculated. How "Green" is your PC? 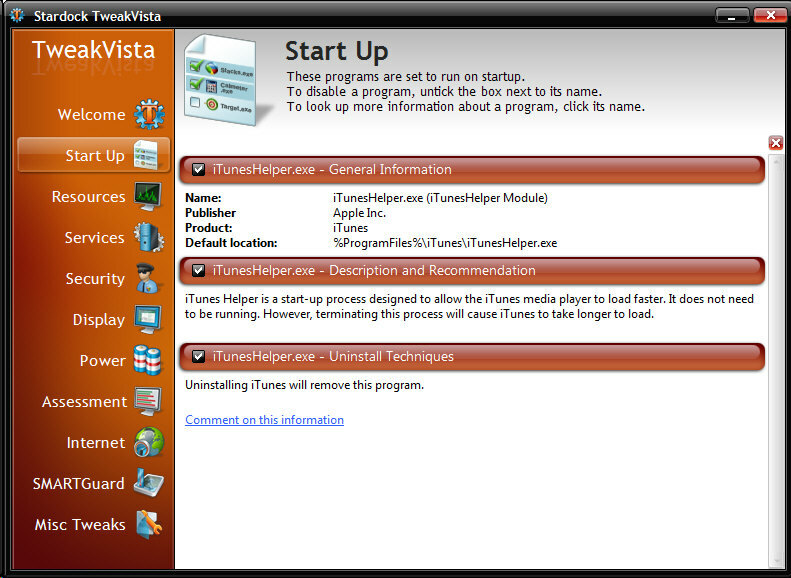 Click on the Information button on the right for longer descriptions of TweakVista features. TweakVista takes a look at your system and makes some suggestions on how you could improve system performance and provides live updates via TweakVista.com! Not to be confused with Microsoft's System Restore Points (also unofficially called snapshots) this new feature of TweakVista allows users to determine "what changed" from a software perspective on their PC. TweakVista will now display what services are running inside of the mysterious "Host Processes for Windows" processes that show up in Task Manager. This will help users determine what services are taking up memory, what those services are and combined with the new Services Tab allow them to disable unnecessary services on the computer. The user can click on items in the Start Up tab to obtain descriptions of the items. 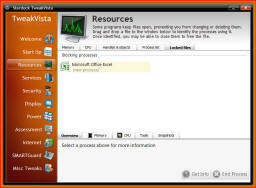 TweakVista Start Up and Resource tabs allow the user to turn on and off items that run every time Windows starts. TweakProfiles allows you to change your running programs and services at the touch of a button! 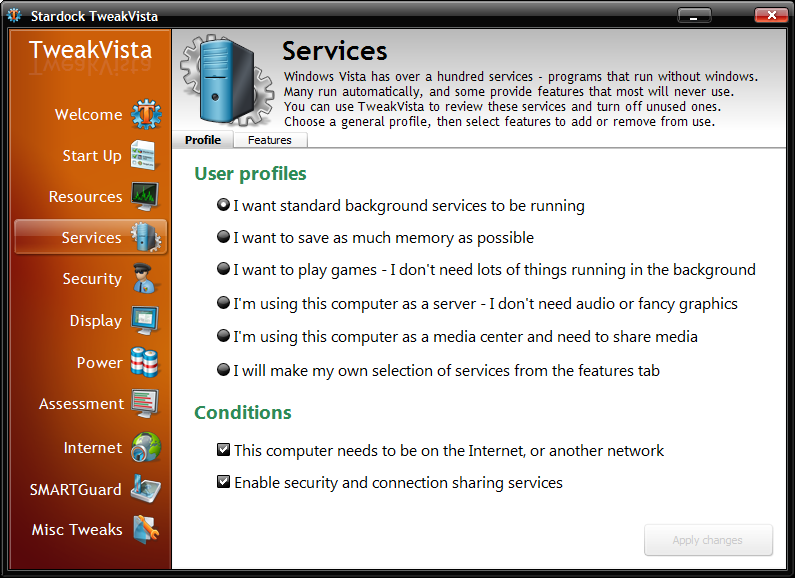 Several default profiles are provided such as a gaming profile that eliminates unnecessary background tasks to provide you maximum in-game performance. 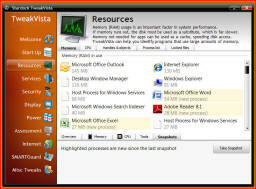 Windows Vista has a one size fits all set of services that, by default, run slowing down your computer and using memory. 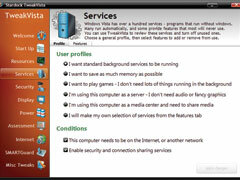 With TweakVista, you can look at these services and decide which ones you want to use. 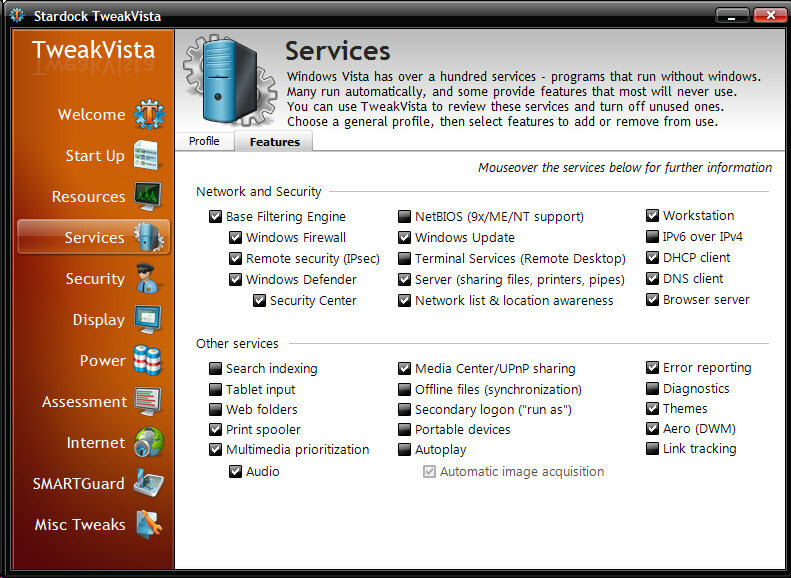 Or you can tell TweakVista how you use your computer and it will pick which services you really need. What is your PC's energy use and carbon foot print? 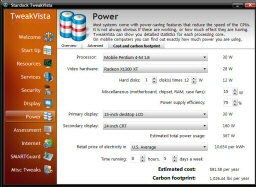 TweakVista will estimate how much power your PC uses. 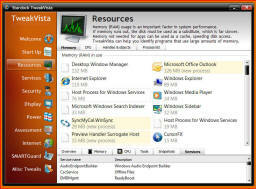 TweakVista consolidates the information provided by the Windows Vista Assessment (a benchmark of your computer hardware). 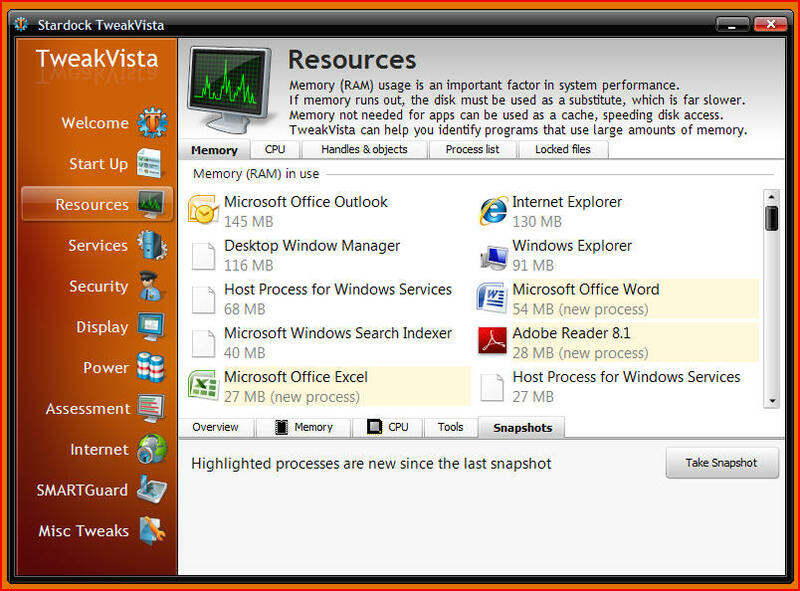 Users can elect to upload that information to compare their computer against other TweakVista users. TweakVista can now tell you what process has a file locked. A locked file is a computer file that cannot be altered. Normal users of such files cannot alter the information they contain, change their location, or alter their names. Often this is caused by a program opening a file as an exclusive read. This means that the file cannot be deleted or edited. TweakVista can tell you what program has the file locked. By stopping the process that has the file locked, users can regain access to these locked files. This feature allows users to view services and start/stop/disable them. Services also are now also support by the Get Info button to learn more about a particular service before making changes to your system.